The University of Manchester held its second MBA graduation ceremony in the region, for students of Manchester Business School (MBS) Middle East Centre, at Jumeirah Emirates Towers,on Thursday November 20th 2014.The Presiding Officer at the graduation ceremony was the Dean of MBS, Professor Fiona Devine, and the ceremony was held under the presence of His Excellency Sheikh Nahayan Mabarak Al Nahayan, UAE Minister of Culture Youth & Community Development; Sheikh Nahayan also addressed the congregation. 84 graduates were be awarded the University of Manchester MBA degree at the ceremony, which was attended by family members, VIP guests, students and alumni of Manchester Business School. The MBS Middle East Centre supports more than 1,700 part-time MBA students in the region, many residing in the UAE, and has a community of around 2,500 alumni in the region. The School offers the part-time Manchester Global MBA programme with the option of four learning pathways to working professionals who meet the entry criteria. The MBS MBA progammes are triple accredited and are consistently ranked amongst the worldâ€™s top ranked programmes. Randa Bessiso, Director - Middle East, Manchester Business School said: "The University of Manchester graduation ceremony in the Middle East is a testament to the success achieved by MBS since the centre opened in Dubai in 2006. Dubai Knowledge Village has proved to be the perfect host and location at the regional hub of training and development. This is a special milestone for MBS and for all our MBA graduates and their families, and we are specially honoured and delighted that His Excellency Sheikh Nahayan Mabarak Al Nahayan generously granted his patronage and personal support to this occasion." Much can happen in 12 months and this is so true of the very dynamic country of the United Arab Emirates, and Dubai - the host of our Middle East Centre. The strong economic growth in the region, led by the UAE, is having a tremendous impact on its rising global reputation, helped by the remarkable achievable in successfully bidding to host the World Expo 2020. If we add to this the recognition of the UAE as the world's fourth most popular international education destination, and the World Economic Forum's ranking of the UAE as third most competitive international destination for professional talent, we can see the strong and magnetic global appeal of the UAE. It is a timely reminder (if one were needed) of the reasons that MBS was attracted to the UAE to establish our Middle East Centre in Dubai, in 2006. I am delighted to say that the Middle East Centre has proved to be every bit as dynamic as the city itself, and Dubai Knowledge Village the perfect host - positioned at the hub of education and training for the region - and whom we now view as close friends of the school, amongst other friendships and partnerships we have forged here. Our Middle East Regional Director, Randa Bessiso, has been central to the creation of these vital relationships; we must congratulate her not only for her outstanding contribution to MBS in the Middle East through her professional leadership and personal qualities, but for her success in being ranked among Forbes Middle East's 200 Most Powerful Arab Women 2014. She leads an outstanding team, which works tirelessly to support our large and growing body of MBA students in the region. Our students, graduates and alumni, are all part of a global MBS community of high calibre working professionals. The region continues to attract some of the most accomplished professionals looking to develop their careers and we are able to recruit very talented individuals - not least for our new Global Executive MBA (GEMBA) programme, launched recently. Our experience in the Middle East has proved to be of significant value to MBS worldwide and to the wider University of Manchester, which now has access to greater insights into the educational needs and potential of the region. It is also revealing to note that Dubai is an increasingly popular choice as a workshop destination for MBA students, and a perennial favourite amongst our teaching faculty. This 2014 MBA Graduation Ceremony is another proud moment for Manchester Business School in the Middle East and, of course, for all our new graduates. Once again, we are deeply indebted to His Excellency Sheikh Nahayan Mabarak Al Nahayan, United Arab Emirates Minister for Culture Youth & Community Development, for his generous patronage of our 2014 Graduation Ceremony. His enthusiastic commitment to creating world-class educational opportunities in the UAE is truly inspiring. Graduation is not the end but the beginning of a new chapter in our relationship with students and our aim is to make this a career-long and lifelong relationship with our global business school. On behalf of Manchester Business School Middle East Centre, our warmest congratulations to all our new graduates on your achievement and we look forward to continuing our relationship with all of you, as part of our growing alumni community. The quality of our students has been the defining feature of MBS in the Middle East, since we opened our centre in Dubai, in 2006. Many are already in senior positions and a significant proportion joins us with an existing Master's level education and/or professional qualification. The region is very effective at attracting well-qualified, talented business people. The UAE and Dubai are in the vanguard and have done outstanding work in establishing a high quality and well regulated private education sector that is attracting leading education providers - and I am very pleased to say that many of them are from the UK. Research, consulting and talent management are all part of our mission in the Middle East and we aim to do more in future. Much of our recent success in the UAE and the Middle East has been built on the collaborations we have developed with our hosts Dubai International Academic City, Dubai Knowledge Village, and TECOM; I would like to extend our deepest gratitude to the leadership for their substantial support and encouragement. This collaborative approach with organisations such as UKTI, and professional bodies including ACCA and IMA - continues to create many mutual benefits and is a distinctive feature of our regional operations. 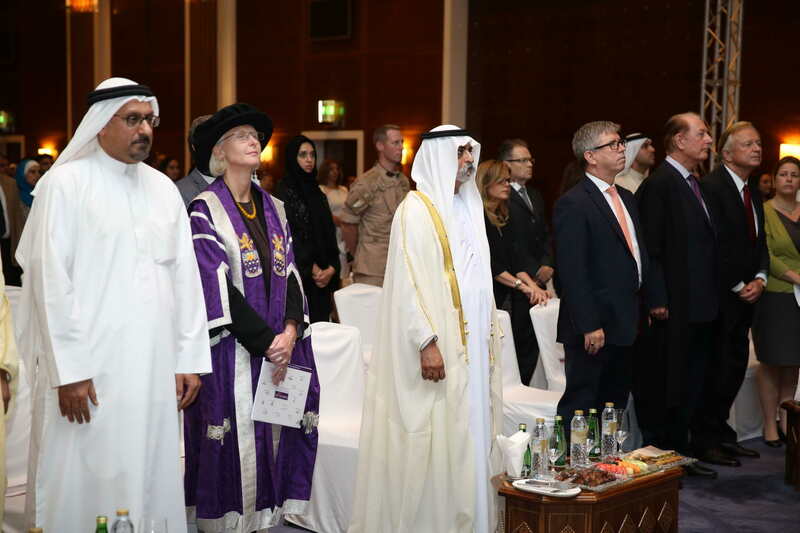 Bringing the University of Manchester's MBA graduation ceremony to the Middle East is a mark of the very high respect, which the University has for the UAE. We are so privileged and honoured to be holding this occasion under the generous patronage of His Excellency Sheikh Nahayan Mabarak Al Nahayan, UAE Minister of Culture Youth and Community Development, with whom we have enjoyed such a warm and cordial relationship over many years and whose work and words continue to inspire us all.